I have never had such a generous garden. On any given day of the year, there is some delicious super food ready to eat. I am grateful to the previous owners for planting fruit trees, and also the benign Hawke’s Bay climate, which gives us enough of a winter chill for stone fruit and raspberries but is warm enough for citrus. Our bounty includes Satsuma mandarins and ‘Yen Ben’ lemons and navel oranges. New planting started two years ago to future-proof this happy state of affairs, with replacements for aging trees and experiments with different varieties in an effort to get an even better spread of citrus to harvest throughout the year. To grow citrus with absolute ease takes a warm, frost-free climate but the hardier varieties can shrug off a brief light frost. Amazingly, my ‘Kaffir’ lime seems not to have noticed any frost at all. I put this down both to the fact that it is growing in a large terracotta pot up against a concrete block wall – by chance, I have found its ideal microclimate – and because it is a rudely healthy specimen. It has been pampered throughout the summer with frequent doses of worm wees. For any citrus tree, a few hours at freezing temperatures is enough to severely damage both fruit and foliage a bigger freeze can be fatal. But that doesn’t rule out growing them in the coldest winter climates. Exceptional plants are worth going to exceptional lengths for, and we can grow our citrus in pots brought into shelter over winter. That’s what the French, Italians and Brits have been doing for centuries – quite literally, in some cases there are trees up to 500 years old in some of Europe’s grand orangeries. Because citrus trees are so versatile, and relatively small, it’s not too difficult to find room to grow more. As well as fruit, they provide multiple ornamental benefits great shape, glossy evergreen foliage, cheerful winter colour and deliciously fragrant flowers. I wouldn’t want to be without them. ‘Yen Ben’ is an improved ‘Lisbon’ lemon, bred in Queensland. Because they never really stop growing, lemons and limes are more sensitive to cold and less able to recover from frost damage than other citrus, which hibernate over winter. In subtropical areas with mild winters, lemons will flower almost continuously and can bear multiple crops throughout the year. They are the best citrus to grow in coastal areas where the sea breeze moderates the temperature extremes of both winter and summer (oranges need heat for sweetness). ‘Meyer’ is the most popular garden lemon because of its cold tolerance and compact size. ‘Meyer’ owes its hardiness to the fact that it is actually not a true lemon. It is a hybrid between a lemon and a hardier citrus, thought to be a mandarin. It is named after an American plant explorer, who found it growing as a pot plant in China in 1908. ‘Meyer’ fruit are thin-skinned, rounder and a brighter orange-yellow than other lemons. They are less acidic, great for gin and tonics but not considered as good as true lemons for cooking. But in a cooler climate, who’s complaining? It is hardy to around minus 4°C and is excellent for growing in pots. It has few thorns and fruits heavily year after year. Ripe fruit will last several months on the tree. ‘Meyer’ lemons grow very well on their own roots (from cuttings), which makes them very affordable – and worth considering as a hedge shrub. ‘Lemonade’ is not a true lemon but paler in colour than ‘Meyer’. This variety has a mild grapefruit flavour, which makes it great for kids. It can cope with a light frost once established. ‘Yen Ben’ is the main commercial lemon grown in New Zealand. It is a selection of the old ‘Lisbon’ lemon but with thinner-skinned fruit on a smaller tree. 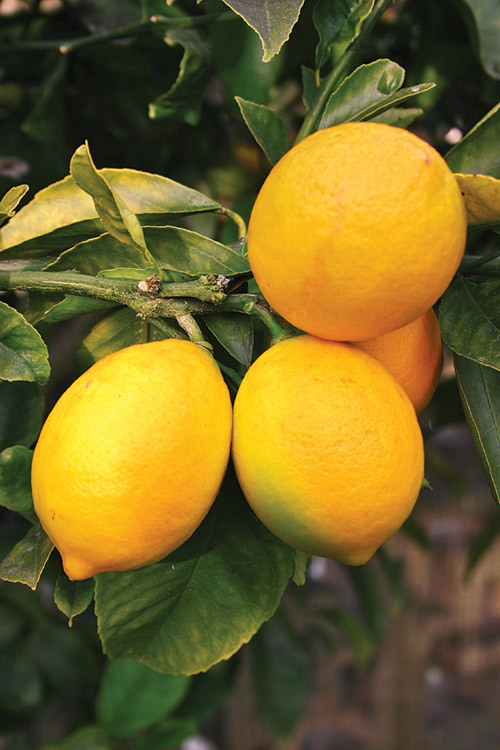 ‘Yen Ben’ will tolerate mild winter frosts once established and is a prolific bearer – a great choice for any garden but especially for cooler-climate gardeners who want a juicy, acidic lemon without too many seeds. ‘Yen Ben’ has a main crop which matures in July but, in warm climates, it is harvested almost all year round. ‘Lisbon’ is similar to ‘Yen Ben’ but is a much larger tree with thorns. It bears its heaviest crop in late winter and spring. The pale yellow fruit is borne inside the canopy, sheltered from heat, cold and wind. ‘Villa Franca’ is a thick-skinned Italian variety borne freely on a medium-sized tree, which in warmer climates bears a good summer-autumn crop. ‘Genoa’ is known for its high yields and moderate size. This almost thornless tree is well-suited to most home gardens. It fruits well from a young age. 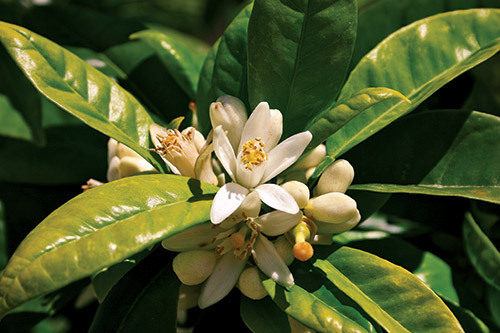 Orange blossom is strongly scented and the nectar attracts hordes of honey bees. The sweet orange has become the most commonly grown tree fruit in the world. It is more cold tolerant than lemons but the sweetness and time to ripening depends on sunshine and warmth. There are sweet oranges and bitter oranges. The more ancient bitter oranges, such as ‘Seville’, are grown mainly for ornamental purposes but they are more cold tolerant and are good in marmalade. Navel oranges have a “mini orange” embedded in the apex of the fruit, which from the outside looks like a navel. Navel oranges fruit mainly in late winter and spring. ‘Carter’s Navel’ and ‘Washington Navel’ are well-known old varieties. ‘Newhall’ is recommended as the navel orange with the sweetest seedless fruit. Not as vigorous as ‘Washington Navel’, it’s good for a container. ‘Fukumoto’ has large fruit with excellent colour. ‘Navelina’ is very early. Blood oranges, such as ‘Tarocca’, have red colouring in their flesh, most vividly in hot, dry climates. Best in a warm sheltered spot, the fruit matures in late winter and has few seeds. Valencia oranges are the world’s leading commercial oranges. The New Zealand form is ‘Harwood Late’, which is harvested mainly in autumn after it has been sweetened by the summer sun. Easy-care, easy-peel Satsuma mandarins are an excellent convenience food for kids of all ages. These small spreading trees have an appealing, open habit. With intensely fragrant flowers, they make a lovely courtyard tree. Satumas are among the cold-hardiest citrus comprising a good range of varieties, including ‘Aoshima’, ‘Kawano’, ‘Miho’, ‘Miyagawa’, ‘Okitsu’ and ‘Silverhill’. Plant a selection of these and you may have fruit from April to August, but one is enough for an average-size garden. The flat-shaped fruit has very loose, thick skin. Cute little ‘Clementine’ mandarin is a delightful ornamental, perfect for growing in pots or planting in rows in a formal border. It has perfectly round, bright winter fruit and a neatly compact habit to match, especially when grown on a dwarfing rootstock. Lush, bright green foliage sports sweetly scented blooms. The fruit is thin-skinned, not difficult to peel, and the flesh is extremely sweet and juicy. There are various strains available. Though not as hardy as the Satsumas, ‘Clementine’ mandarins will cope with light frosts. 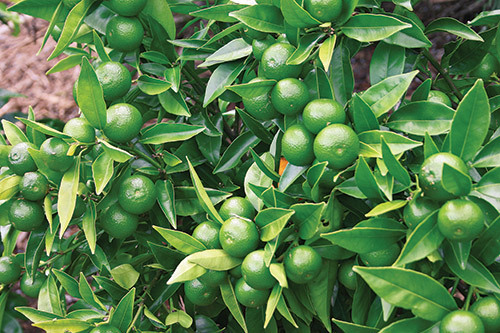 If you want to avoid seedy fruit, don’t plant clementines close to other citrus trees. Popular ‘Encore’ mandarin follows ‘Clementine’ with its summer crop. ‘Richard’s Special’ fruits mainly in September. The two main grapefruit varieties grown in New Zealand gardens are ‘Golden Special’ (aka Poor Man’s Orange) and ‘Wheeny’ (aka true grapefruit). ‘Golden Special’ makes a sweet winter breakfast drink with no added sugar, although in a colder climate its fruit is not as sweet. There is no doubt that feeding citrus makes a huge difference to growth and fruiting. It is especially important to feed young trees and those in pots. The easiest course of action is to apply a citrus fertiliser as directed on the packaging. Chemical fertilisers, however, do nothing for the long-term health of the soil. Organic gardeners have success with a variety of manures, including sheep pellets, seaweed, fish fertiliser, comfrey, well-rotted chicken manure, and blood and bone. Use these in combination with good compost and organic mulch applied in spring. Mulching is the best way to keep weeds down as citrus are sensitive to weed sprays and cultivating or mowing around their shallow roots is best avoided. Don’t use powdered fertilisers on potted citrus as this risks burning the roots. Apply controlled-release granules granules in spring, then weekly doses of worm tea throughout the growing season.